Mayor Mufi Hannemann's administration believes residents are not recycling all of their green waste. So city officials are looking at a possible mandate to prohibit yard clippings from being put into regular household garbage. "I would think we would be considering that in order to get the maximum amount of green waste out of the waste stream. I think we may end up exactly in that position," Martin Okabe, executive assistant to the Department of Environmental Services director, told the City Council's Public Works and Energy Committee. But Okabe and other environmental services officials said the bugs still need to be worked out in curbside green waste recycling before any mandate is put into place and before the program is expanded to other parts of the island. "We wouldn't want to require or push the residents into the system until we smooth out these operational issues," said Suzanne Jones, the city's recycling coordinator. Currently, 50,000 homes from Wahiawa and along the North Shore and Windward Coast through Waimanalo are participating in the city's automated green waste recycling program. The city uses the one-armed trucks to pick up blue and gray bins filled with yard waste. Environmental services officials told committee members that the amount of green waste picked up during the first four months of the start of the automated green waste pickup was slightly higher than when the city picked up yard clippings manually during the same time last year -- 1,875 tons from March through June last year versus 1,961 tons during the same period this year. "There was a slight increase, but the numbers are too small to say that was meaningful," Jones said after the meeting. "Basically we are recovering virtually the same amount of material." 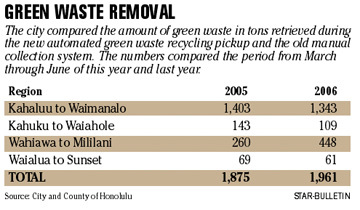 Jones said, however, there was a significant increase in the amount of waste collected from the area that includes Wahiawa and Mililani, an area where the city implemented a pilot recycling program under the previous administration. "Then the question moves to how are we going to increase, get more recovery utilizing the bin system or just green waste in general," Jones said. "Then the discussion moved to public education, more encouragement, or does it have to be mandated." Councilman Charles Djou said he does not disagree with those approaches, but that he would prefer the city embark on a more comprehensive curbside recycling project, including pickup of newspapers and glass to improve recycling participation. "What I am a little concerned about is that I'm not seeing any results," Djou said. Director Eric Takamura told the committee of one lesson the city has learned. "We know that people are still putting their green waste in the regular trash. It's not coming out in the blue bin," Takamura said.